Restora­tion and con­ser­va­tion efforts along the Bear Branch trib­u­tary to the North San­tiam River are part of a larger regional ini­tia­tive to improve water­shed health. 1. How large is the area of land that drains into Bear Branch Creek? 2. How long is Bear Branch Creek? 3. What is the range of ele­va­tion of Bear Branch Creek? 4. 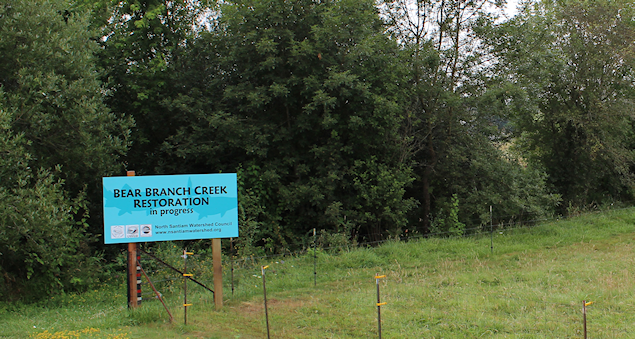 How is land in the Bear Branch Creek Water­shed Used? The land area sur­round Bear Branch Creek is used by a vari­ety of diverse water users, includ­ing range­land and crop­land agri­cul­ture, rural res­i­den­tial landown­ers, forestry, and urban landowners. 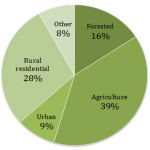 The rel­a­tive per­cent­ages of land use in Bear Branch Creek. What kinds of fish use Bear Branch Creek? Over the last ten years, fish sur­veys con­ducted by the Ore­gon Depart­ment of Fish and Wildlife have shown the pres­ence of a num­ber of dif­fer­ent species, includ­ing cut­throat trout, sum­mer steel­head, dace, red­side shiner, peamouth, sculpin, brook lam­prey, north­ern pikeminnow, and three-spine stick­le­back. These stud­ies also indi­cated that Bear Branch Creek offers valu­able habi­tat for native fish, includ­ing Upper Willamette win­ter steel­head. Bear Branch Creek has 3.6 stream miles of poten­tial rearing/migration habi­tat for spring Chi­nook and 3.9 stream miles of poten­tial rearing/migration habi­tat for win­ter steelhead.